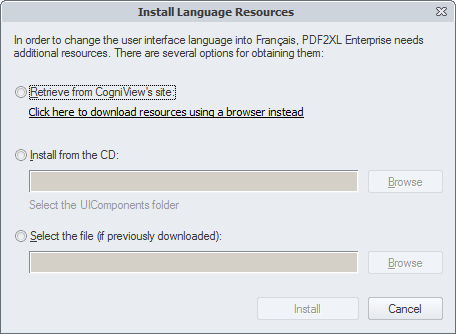 Retrieve from CogniView's site: Attempt to automatically download the required resources and install them. Install from the CD: If you have PDF2XL's installation CD, you can install the required resources from it. Simply select this option and use the Browse button to locate your CD drive. Select the file (if previously downloaded): If you've already downloaded the required resources, for example by clicking on "Click here to download resources using a browser instead", select this option and then use the Browse buton to locate the resources file.